Simon Benham's Blog: Well it was dry in the Peak District! We had a great weekend camping in the Peak District with our friends Jason and Tina from Stockport. We obviously had the best of the weather as it seems to have chucked it down all weekend here. 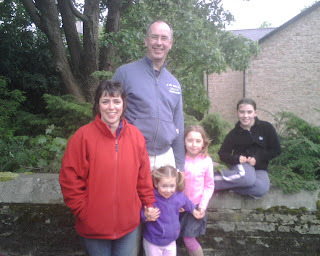 Whilst up there we caught up with Chas and Bindy Oakley and family (in the photo) who moved from us last year to join the church in Buxton. They're doing really well family, church and job wise which is great to hear. We rang the bell in the office this morning as a girl made a first time commitment at the youth BBQ on Friday night and a number of children did the same in Kids2 on Sunday morning. I must go away more often! Let's pray for them all that they would know God with them powerfully this week. We're on the way to my parents to bury Bowler, one of our rabbits, who sadly died at the weekend. I've then got a day away with the elders all day tomorrow, off to Wales tomorrow night to climb Snowdon with Jacob on Thursday then back for Russell and Kerry's wedding on Saturday and church on Sunday. Life in all its abundance!